We find particles in our hydrogen cars. The assumption is that they come from the filling station. Can you develop a particle collection apparatus that can be hung between the filling station and the vehicle to collect particles and then analyze them in the laboratory? 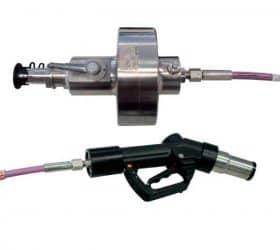 Development and testing of a particle collection apparatus (PSA-H70) for hydrogen filling stations and hydrogen cars. During vehicle testing, our client found numerous particles and corresponding damage to the hydrogen tank system. Of course, it was always “the other” who caused the damage. Our client asked us, together with filling station builders and a component manufacturer, to find a solution with which the cause of the particles can be clearly proven. Together with the company Hydac and in cooperation with the company Linde we have developed the particle collection apparatus PSA-H70. An operator can hang this between the filling station and the vehicle during refueling. The refueling then proceeds quite normally. All particles are collected in a very fine filter membrane. The PSA-H70 can then be taken to a laboratory for disassembly and analysis under clean room conditions. The filter membrane is designed in such a way that it can be automatically analyzed under standard microscopes and the type of contamination determined. The PSA-H70 is distributed by Wenger Engineering GmbH. For an offer please contact our sales department, e.g. by using the chat at the bottom right.